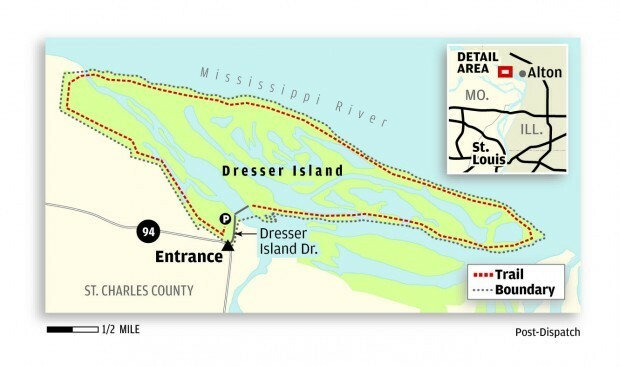 Dresser Island is part of the Missouri Department of Conservation’s Upper Mississippi Conservation Area and is located off of Hwy 94. The trail is a 6 or 7 mile loop on a levee. The surface is flat – no hills – but the walking surface can be irregular and rutted. The Conservation Department has worked on the surface over the years. Walkers can choose to walk the whole loop or walk a distance out and back to the parking lot. Directions: from I-270 take MO-367 north toward Alton, IL. Continue approximately 6.5 miles as MO-367 turns into US 67. Turn left at the traffic light on to MO-94. Drive approximately 4 miles. MO-94 will make a sharp right turn – continue on MO-94 another .5 mile. Make a right turn onto Dresser Island Drive. Drive a few hundred yards to the Conservation Area parking lot.